The liquid soft soap is the vintage household product that makes a smashing comeback and for good reason, at home (inside and outside) the liquid soft soap cleans and polishes anything,everything, and more without polluting. Le Savonnier Marseillais got its humble start from "grandmother's recipe" which has been updated to offer you liquid multi-purpose olive oil soap with its concentrated formula that will delight even the most discerning critic of the house, including the most demanding who are also keen in keeping their environmental footprint low as well as their budget. Let's not spoil our fun and let's get serious, why not start from the ground up? And yes, the soap is very effective for cleaning floors and all types of flooring: tiles, parquet, linoleum, polished concrete, marble etc ... The texture of this creamy liquid soft soap makes it very convenient to adjust the dosage based on need. 2 tablespoons of liquid soap (3 or 4 if the soil is very dirty) in 5 liters of water and mop as usual. For carpets and rugs, dilute soft soap and water and rub the spot lightly. Especially safe on furniture, the leather finish will not glisten, not to mention the outdoor furniture and garden. Then we can tackle the kitchen household appliances, backsplash, all washable surfaces even glass. For the latter we use a microfiber cloth for extra shine. We can also use the liquid soft soap for washing dishes by hand only (not recommended for the dishwasher) including cleaning fryers and barbecues .. 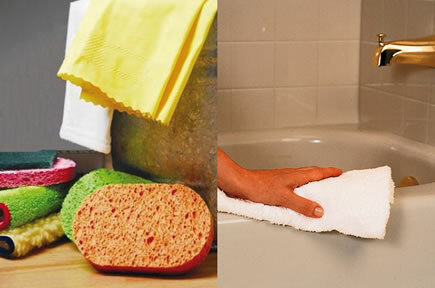 In the bathroom, the liquid soft soap is used for cleaning bathtubs, counters, sinks and also furniture. In conclusion, it is simple, with our Le Savonnier Marseillais liquid olive oil soft soap, wash everything describe above without polluting , and the list is not exhaustive!